Gracie is one of the lucky ones. 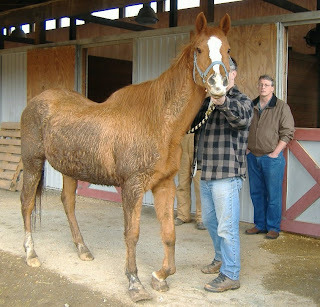 Abandoned, emaciated, and crippled due to longstanding neglect, the 20-something chestnut mare's prospects were dim. She was in the temporary care of an Animal Control officer in Union County, North Carolina, with little hope of ever being adopted. That's when Darlene Kindle, President of Carolina Equine Rescue & Assistance (CERA) stepped in. Asked if she could take this hapless mare, Darlene thought to herself, "I just cannot take in another horse. We already have 13 horses, donations are down due to the economy, the spring grass has not come in, and we are already struggling to properly care for the horses we have." Still, Darlene decided she needed to meet this mare. "When I saw her, my heart crumbled," she remembers. "She was severely emaciated, her hooves had not been trimmed in four or five years, and she could barely stand." Darlene's initial instinct was to walk away, but she just couldn't. "I was touched by the sparkle in her eyes, the expression on her face, and my gut feeling that this mare had the will to live and that she deserved a chance." Her name was Gracie.